• Place the cookies in a blender until they form a sand-like powder. Add the butter and mix together well. • Press the cookie mixture into a well oiled pie pan with the back of a spoon so that it is well compacted and evenly lining the whole pan. • Bake for 10 minutes at 220C. • Meanwhile, in a mixing bowl, combine all ingredients for the peanut butter filling and mix with a hand mixer until smooth and creamy. 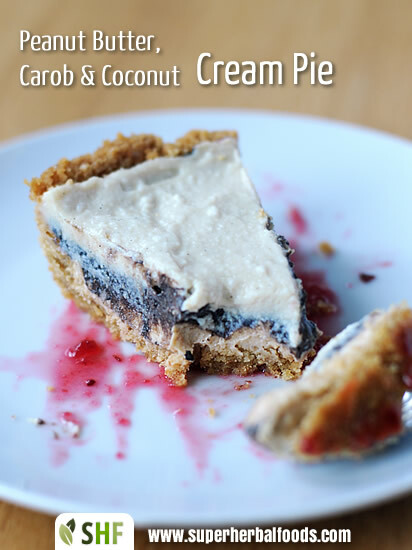 • In another bowl, mix the carob filling ingredients with a hand mixer until smooth and creamy. • Chilling the coconut cream will cause the water and the cream to separate. The layer of cream will float to the top of the packet. Mix all the coconut cream ingredients and chill. • Once the pie crust has cooled, evenly add the layer of peanut butter filling with a spoon or spatula. Put in the freezer for 30 minutes to allow it to set nicely. • Next add the carob layer with a spoon or spatula and put in the freezer again for another 30minutes. • Top it off with the layer of coconut cream and again in the freezer for another 30 minutes. • Transfer it in the fridge for at least another hour to allow the layers to set.